When CannaTea needed to create giveaway products for their trade show booth, we presented them with this 100% Microfiber Smart Phone Cleaner, dye sublimated with their PMS matched corporate colors. Since they’re known for handcrafting their own premium products, CannaTea expected nothing short of perfection. 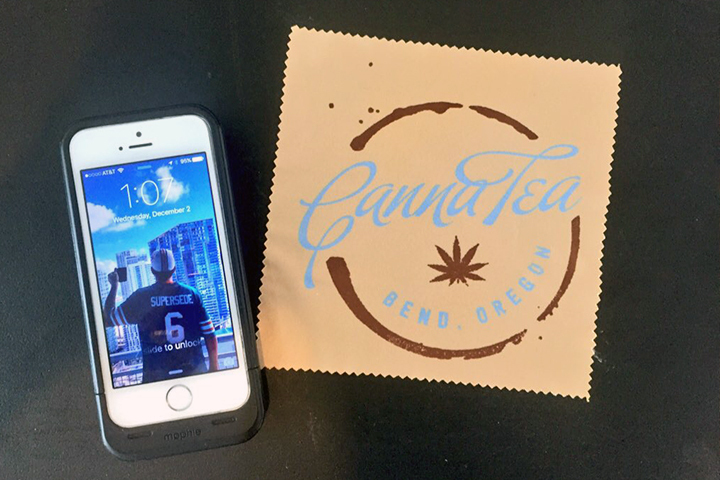 Specializing in eco-friendly solutions made only with all-natural ingredients, it was important for CannaTea to represent their brand in a similar fashion through their printed promotional products. Wipe the competition clean with our premium Microfiber phone cleaner. Measuring 6″ x 6″, our microfiber screen cleaner cloth is the perfect solution for wiping off fingerprints and smudges from any LCD screen. Use it on your sunglasses, sensitive camera lenses, laptop computers, tablets and more. Constructed out of soft 170g microfiber, our phone cleaner is just right for polishing sensitive surfaces without leaving any harmful marks. Additional setup charges may apply. Please ask your account executive about rush service pricing and availability. Restrictions may apply.